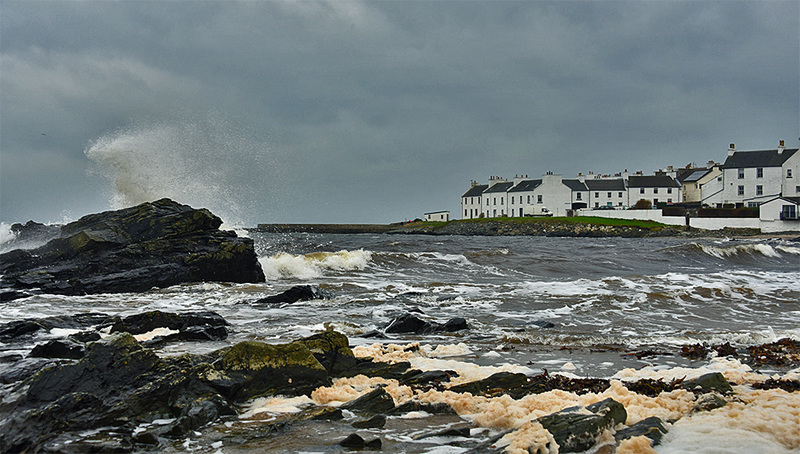 Another take on the moody day at Port Charlotte, this time with added water splashing over a rock. This entry was posted in Beaches, Cloudy Weather, Landscape, New Post, Sea Loch, Village and tagged Islay, Loch Indaal, Port Charlotte, Rhinns of Islay by Armin Grewe. Bookmark the permalink. Love your photos, +Armin Grewe I have hopes of someday getting there… but I’m almost 72, so it’s a challenge! +Celia Lewis Fingers crossed you’ll make it someday. I guess it will be rather long journey for you? Not sure what direct flights from Glasgow to North America still fly these days, I think most journeys require a detour via London? London would be easier – direct flights. Then… train? and ferry? Got to save all my shekels for this. But I’m hoping. Either that or if your budget allows fly up to Glasgow and then fly to Islay. On a good day the flight to Islay is amazing. On the other hand the journey from Glasgow to Kennacraig is a very nice one as well, not to forget the ferry crossing. For me it’s an important part of the holiday.